On 28 July 1501 Nicolaus Copernicus and his brother Andreas were granted permission to continue their interrupted studies in sunny Italy. Andreas was to broaden his knowledge of law, whereas Nicolaus was granted leave of absence to study medicine in order to become ‘a medical advisor to our very reverend master [Bishop Lucas Watzenrode] and canons from the chapter in the future’. 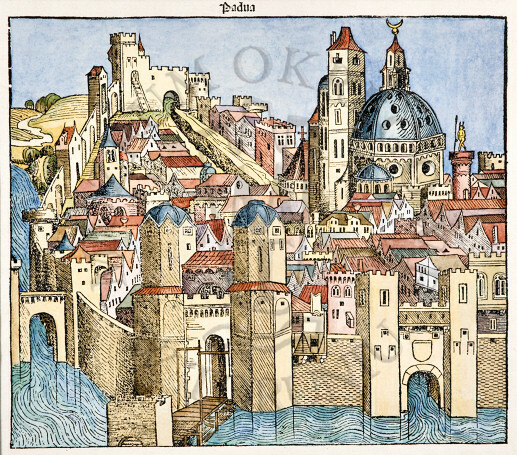 In the autumn of 1501 the brothers returned to Italy, Andreas studied law (in Bologna and Rome) while Nicolaus enrolled at the famous University of Padua. The university owed its beginnings to a group of students and professors who left Bologna for Padua in 1222 and founded a Universitas iuristarum there. In 1399 another institution that enjoyed similar rights and privileges, the Universitas artistarum, came into being. Both separately elected their rectors and had their own statutes. The student body was then divided into powerful student corporations known as ‘nations’ and when Copernicus studied in Padua 29 functioned there, out of which seven made up the ‘university of artists’ and the remaining - ‘the university of jurists’. In the 15th c. Padua was regarded as second (after Bologna) for juristic studies attracting students from many European countries. Badly in need of lecture rooms, the university searched for new space, finally acquiring the Hospitium bovis (Ox Hotel) which, in order to serve its purpose, had to be remodelled. The later name of the main building of the University of Padua - Palazzo del Bò (possibly a contraction of ‘bovis’) - has its origins in that first university building. There is no information supported by any reliable sources whether Copernicus continued his legal studies started in Bologna a few years before. Copernicus above all devoted his time in Padua to medical studies. He concentrated on such ancient authorities as Hippocrates, Galen and Avicenna, studied the anatomy of the human body and the healing properties of herbs. Although anatomy did not have its separate faculty, the anatomic theatre served as the place where public dissections were performed, with the students observing their professors. It was also the medical students’ duty to accompany their professors visiting the sick. When Copernicus was in Padua, among professors of theoretical medicine were such renowned figures as Bartolomeodi Montagnana the Younger, an author of papers on syphilis, Gabriel Zerbi, an anatomist, internist and a follower of Avicenna, as well as Pietro Trapolin. Copernicus was a diligent student of medicine and even purchased a few textbooks including Practica medicinae by Joannes Michael Savonarola and Liber pandectarum medicinae by Matthaeus Silvaticus. Copernicus must have covered all the material constituting an artium baccalaurens (three year) degree because when he came back to Prussia he had a good reputation as a physician. Copernicus also studied languages and, most probably under Niccolò Leonico Tomeo (1456-1531), learnt classical Greek well enough to start tran slating Theophylact Simocatta’s Letters. While still in Padua he learnt that he had been granted the ‘scholasteria’ of the Church of the Holy Cross in Wrocław. On 10 January 1503 he appointed procurators for the takeover of the benefice granted to him and soon afterwards left Padua for Ferrara to sit a doctoral examination in Canon Law.